SKF NOTE: Live and learn. Drummers playing while standing is not new. Slim Jim Phantom of Stray Cats comes to mind. What is new to me is a standing drummer first influenced by “Tony Williams, Elvin Jones, Don Moye, Hal Blaine, Jo Jones, Ed Blackwell, Roy Haynes, Ringo Starr,” but didn’t find his drumming passion until he heard Maureen (Mo) Tucker with The Velvet Underground. Go Mo! The Maureen Tucker video at the close of this post is part of longer interview available on YouTube. 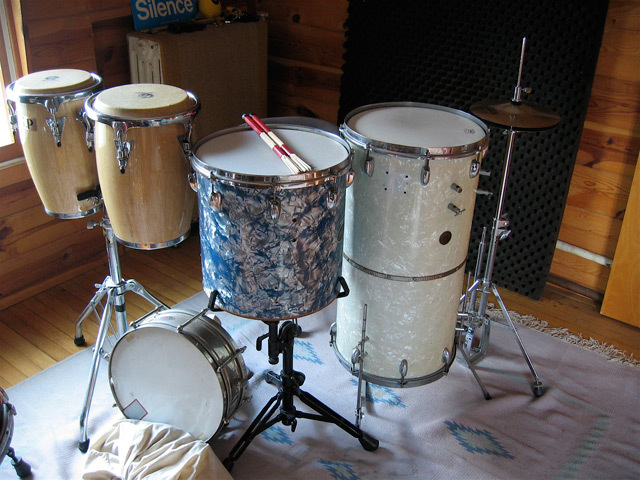 The still shot is of the unique drumset Victor DeLorenzo used while recording his latest album. Published Nov. 27, 2015 at 10:33 a.m. When I started to play the drum set some 40-odd years ago…all the drummers that I admired sat down behind their [drumsets] to guide and power some of the most exciting bands…. My favorites included…Tony Williams, Elvin Jones, Don Moye, Hal Blaine, Jo Jones, Ed Blackwell, Roy Haynes, Ringo Starr and so many more masters of time and taste. Then I heard the music of The Velvet Underground and the gender bending earth shattering drumming of one Maureen (Mo) Tucker! She played fierce, driving beats on a snare drum, batter side turned up bass drum, and big cymbals, usually with the aid of mallets instead of sticks. Although she used such an unorthodox setup, she played with such a conviction that never let you think that there was something lacking in the drum department. Oh, and yes … she was standing up. I wanted to be “the Keith Moon of stand-up comedy drumming,” and then some. This entry was posted in Drum/Music News and tagged Maureen Tucker, Stand-up drummer, The Velvet Underground, Victor DeLorenzo. Bookmark the permalink.